You might have read about getting bigger portions at Chipotle without your wallet taking a hit, well, there are ways to hack the menu at sweetgreen, too. After more than 100 visits, we’re sharing our tips to increase your chances of getting more out of your sweetgreen salad without paying extra for it. We’re talking value –more ingredients for the same price. I don’t have any data or a graph to show, but following these tips will definitely get you more sweetgreen-bang for your sweetgreen-buck. 1. Order In-Person: Yes, this makes a difference. 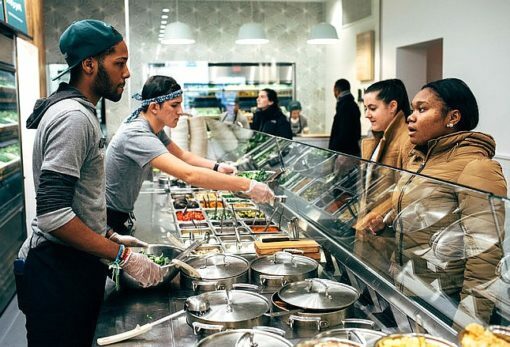 If you’re not going to sweetgreen during their rush hour (lunchtime 11:45 PM-1:30 PM), then it’s better for you to wait in line and order your salad in-person. 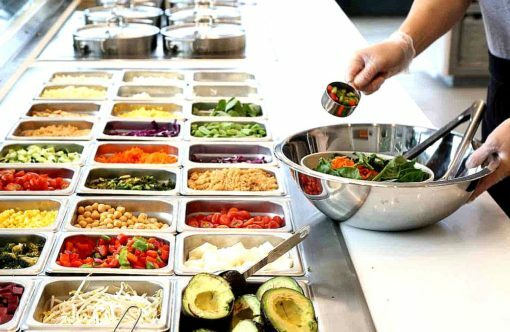 The rationale here is the staff will be more mindful when adding ingredients into your salad than they would just putting together a togo order. 2. Be Friendly: This is true for anything and it comes naturally for most of us, so be nice to the person making your salad. In my experience, their employees are a happy bunch so it’s even easier. The secondary benefit is that it pays off in karma and in the heft of your bowl. 4. Get the Custom Bowl: This is the single, most important choice because it’s the salad with the lowest price point — usually at around $8. Also with a custom bowl, you control each ingredient you put in. 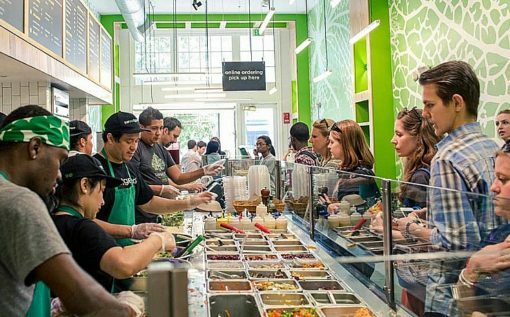 Similar to tip #1, the sweetgreen employees aren’t on “robot mode” quickly creating a Guacamole Greens, Harvest Bowl or Rad Thai; they’re engaging with you the entire process; from start to finish of your salad. 5. Add 2-3 Bases: Same as Chipotle, you have several choices for your base, but instead of two kinds of rice and two types of beans, you have several choices of lettuce. Choose a mix; half and half of say chopped kale and romaine. With the split, you’ll simply get more and it won’t cost you anything more. 6. Add Grains: This is where you can really add to your salad. This if you’ve already got chopped kale and spinach as the base of your bowl, you can add grains to it without the extra cost). I add both their wild rice and quinoa every time, and it rarely adds to the price. Feeling shameless? Add the curry chickpeas, too (oooh you’re good). 7. Don’t Add Premium Toppings: There are several tempting items you can choose after your base, but be careful of the premium ingredients, they’ll cost you. Add-ons like avocado, chicken, blue cheese, seasonal ingredients and Parmesan crisps are delicious, but will push the price of your salad up. 8. Extra Ingredients: With a custom bowl, you’re technically allowed two bases + four ingredients. Generally, you can get away with a fifth without the extra fifty cents. If you have a chill employee working your bowl, you can sneak a sixth item without adding the cost. Whether you can get those for free depends on who is making your salad, how nice you are and whether there’s 800 people behind you. Generally, the busier it is, the more likely you’ll get an extra free ingredient or two. 9. Ask for Double: Another good way to get an extra ingredient with a low chance of it counting in your final total is to ask for double servings of your favorite ingredient like broccoli, sweet potatoes or cabbage. 10. Let’s Go Crazy: We get almonds almost every time we go to sweetgreen. Sometimes pecans. When I add an extra ingredient over my allotted, sometimes they’ll look at me and ask “That will be extra — is that ok?” I’ve never had an employee ask me that after adding nuts. Over 100 visits and not once. Add nuts, bae. 11. Salt and Pepper: Past the bases, ingredients, premiums, and proteins there’s a handful of basic items you can add that can be added for free near the end of the sweetgreen journey. We’re talking some salt, pepper and a lemon squeeze. 12. Free Bread: You usually get a piece of bread, but don’t be shy about asking for an extra piece. I’m avoiding carbs, so you can have mine. 13. Side of Dressing: Even with heavy dressing, I like to add more dressing (or hot sauce) to my salads while I am eating. The extra sauce won’t cost you extra sauce. 14. Pay with the App: Still using your credit card to pay? Stop now. The app pays off because after $99 you get $9 credit. We’ve done the math and that’s essentially earning 9% off everytime you buy something. 15. Be Mindful When Ordering/Don’t Overdo it: Similar to “be friendly” but not. If you’re trying to game the system, don’t make it so obvious when you’re trying to get extra without paying. Don’t look bothered when they tell you it’s going to cost more. Don’t ask for six pieces of bread, triple “broccoli” or tell them to “keep grinding” when grinding out the black pepper. Feel it out after you add your fifth ingredient. It works. We’ve been going to sweetgreen every other day for six months (we’re nearly at Black Status) so we’ve got a pretty good handle of the process, what to ask for, what techniques work, and how to get more for less. If you could do even three or four of these tips, you’ll get more salad for between $8-$12 every time (give or take .50 cents). What if you could lock in 30% off every time you went to sweetgreen? If you’re interested in saving 30% before even walking into the door, let us know.